Radar Scans Show King Tut's Tomb May Have Hidden Spaces Containing Organic, Metallic Materials : The Two-Way Radar scans add weight to the claim that there are secret chambers in King Tut's tomb. One theory: This is the secret, final resting place of Queen Nefertiti. The tomb of King Tut in the Valley of the Kings in Luxor, Egypt. Researchers are investigating whether the tomb contains hidden chambers. Where is Queen Nefertiti buried? It's one of the biggest mysteries in Egyptology, and today, archaeologists might be one step closer to an answer. Researchers have been radar-scanning the walls of King Tutankhamen's tomb in Luxor's Valley of the Kings in search of hidden chambers. 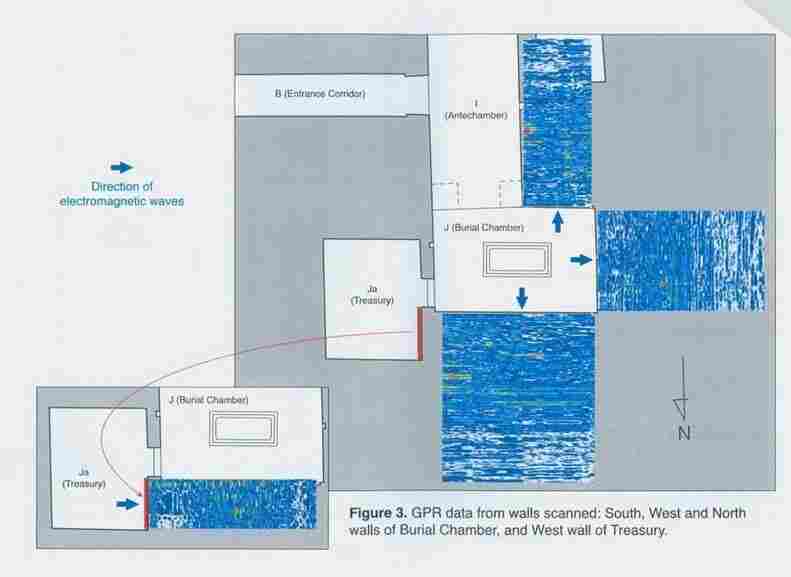 Now, NPR's Leila Fadel tells our Newscast unit that analysis of scans conducted in November shows there are two empty spaces behind the walls. And those spaces may contain organic or metallic material. 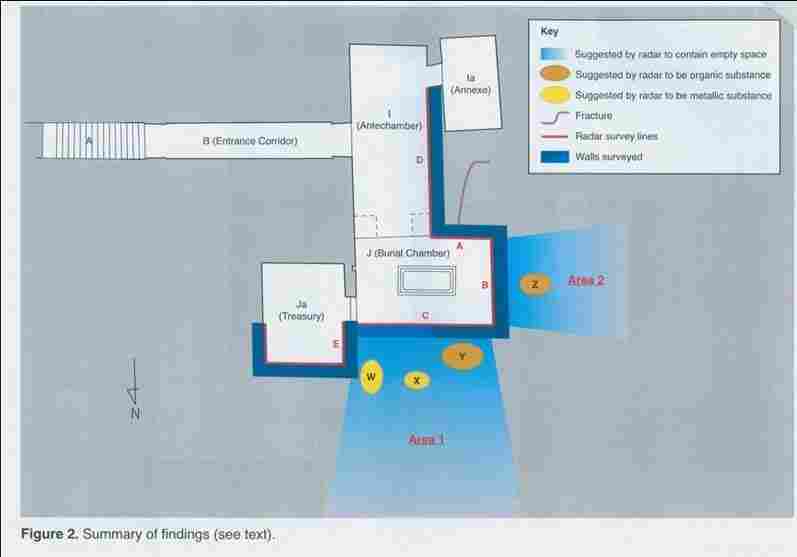 The presence of organic or metal objects would certainly add weight to the theory that the tomb contains hidden chambers — but, as Leila reports, more advanced scans are required before authorities can say for sure. "And if there are chambers, then Egypt will decide how and when to get into those chambers and see whether this is the burial site of [Tut's relative] Queen Nefertiti," Leila says. At a press conference today, Egypt's Minister of Antiquities Mamdouh el-Damaty "declined to comment on whether royal treasure or mummies could be inside," The Associated Press reported. But he didn't mince words about what this discovery could mean. "For Egypt it is a very big discovery — it could be the discovery of the century. ... It is very important for Egyptian history and for all of the world," Damaty said, according to the wire service. 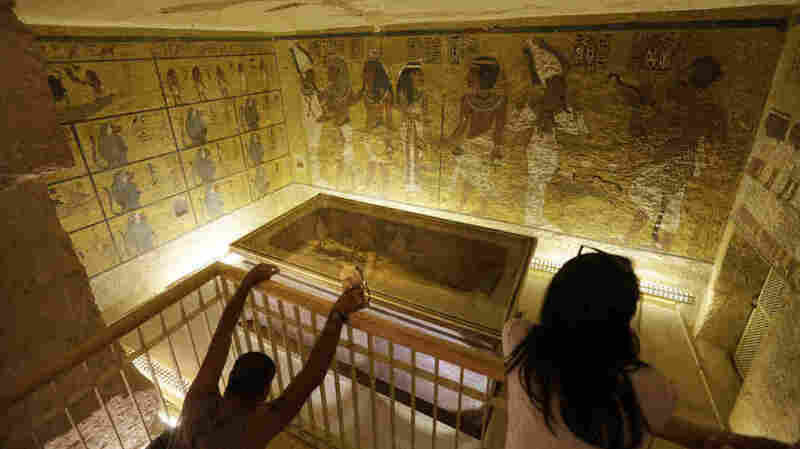 That potential discovery of the century for Egyptology could be hidden in the very site of the biggest discovery of the past century: King Tut's tomb, which was found by British archaeologist Howard Carter in 1922. The remarkably preserved burial chamber of the boy king was "the most intact royal tomb ever found" and contained more than 5,000 artifacts, National Geographic reports. 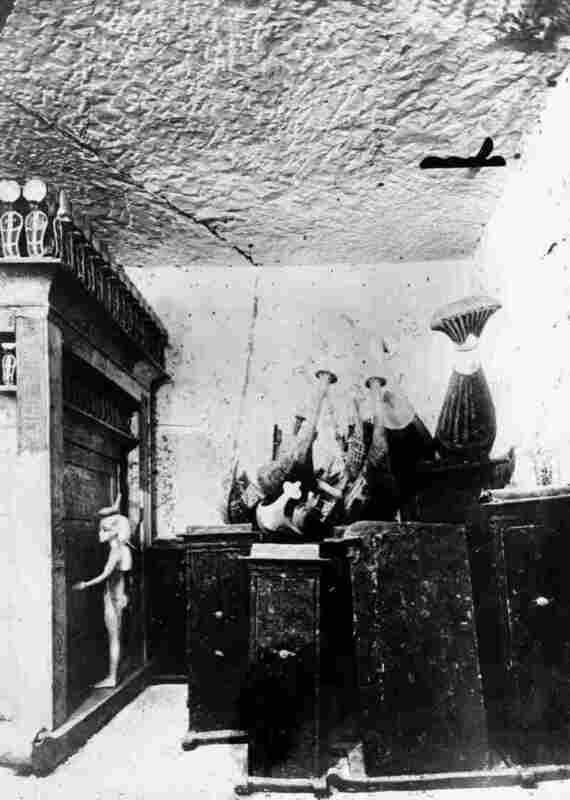 "At the time of Nefertiti's burial within [the possible hidden chamber] there had surely been no intention that Tutankhamun would in due course occupy this same tomb. That thought would not occur until the king's early and unexpected death a decade later." Because there was no tomb ready for Tut at the time of his death, the theory goes, Nefertiti's tomb was expanded to accommodate him. In the complicated Pharaonic family tree, Nefertiti was both Tut's stepmother and his mother-in-law, according to National Geographic. There are other theories about what might lie behind the walls. For example, Damaty "says he believes there's female royalty behind the boy king, but not Nefertiti," according to CNN. "Later this month, a team of specialists from National Geographic will travel to Egypt at Eldamaty's invitation, in order to carry out another series of radar tests, with the hope of confirming [Japanese radar specialist Hirokatsu] Watanabe's results. At the press conference, Eldamaty mentioned that one of the main purposes of the new scan will be to determine the thickness of the walls, in order to decide the next step of the investigation." Kara Cooney, an Egyptologist at UCLA who focuses on Tut's period, tells National Geographic that any discovery would be extremely significant. "It makes us re-look at everything," Cooney said. "You're looking at the coffin, at the tomb, at the statues. Everything about this period has to be re-evaluated." That's a sentiment echoed by Reeves in a recent interview with CBS News. "If I'm wrong, I'm wrong — we move on," he says. "But I think it's something we can't just ignore. Because if I happen to be right, then it will change everything." A previous version of this post misidentified the British Egyptologist. He is Nicholas Reeves, not Christopher Reeves.